What is Marketing Approval Workflow? Understanding and managing your creative approval workflow is more important that ever! Today, marketers are juggling up to six social media sites at any one time and outputting 75% more content than the year before. Still a majority feel they should be performing better. With this, managing marketing approval workflow effectively is more vital than ever. Marketing approval workflow plays an integral role in the production of marketing collateral, from briefing projects to creating artwork to getting final approval. But if your approval workflow isn’t in good shape it can adversely affect the quality, cost and timeliness of your campaigns. It’s important then to understand your creative approval workflow and the kinds of challenges associated with managing it. Only then can your brand implement the right tools and processes to achieve the best outcomes for your creative projects. While marketing approval workflow has commonalities, its touch points and approval pathways are unique to every brand. This is why it’s important to understand your marketing approval workflow so you can evaluate its true effectiveness. For example, create a flow chart that outlines how the work flows through the marketing department denoting every touch point all the way to final production. If you are experiencing issues, at least then you can sit down and review the flow chart to see where the problems lie. Once you’ve identified your challenges there are a few simple strategies you can implement to improve your marketing workflow. Select only the reviewers who are vital to your creative project. Map out your approval pathways strategically. State your deadlines and milestones upfront. Send artwork for feedback and approval only when it is ready. Batch your feedback so that the designer isn’t amending artwork repetitively. While these strategies will enhance your marketing approval workflow, it might well be time to implement marketing approval workflow software. RECOMMENDED READING: Is it time to implement approval workflow software? More brands are turning to marketing approval software to solve their challenges and automate the tedious administration that goes with managing marketing approval workflow. This tool streamlines the approval process from briefing to artwork revisions to saving final marketing assets. There are many great benefits associated with utilising marketing approval workflow software covering the full gamut of the approval process: simple administration, greater transparency, automatic audit trails, improved marketing compliance, reduced artwork revisions, instant reports and more time to be creative! Recent studies show that the return on investment (ROI) for businesses implementing project management tools lies somewhere between 15-30% with 32% of businesses seeing ROI within the first year. In fact, 60% of companies that exceed $500 million in revenue have adopted marketing tools to streamline their marketing approval workflow. It’s worth noting that those who profit from integrating this kind of software typically dedicate time to research, cost and select the right solution. How easy is it to implement? Does it manage all file types: digital, traditional and websites? Is the solution supplied as hardware or software that needs to be installed, or is it a cloud- or web-based solution? How much does the solution cost? What’s the upkeep? Does it provide the capacity to upscale, and add more users or clients? Does it have extra integrated features that could be useful such as resource management? What kind of training does the vendor offer? So you’ve narrowed down your requirements and matched it with the right vendor and the right marketing approval workflow software. Now it’s time to make sure that you have a successful implementation. 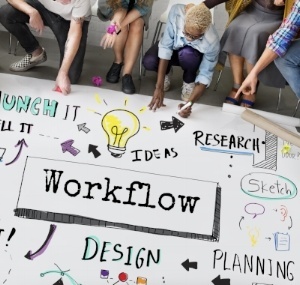 3 great reasons to introduce a marketing approval workflow solution! It’s one thing to select and implement the right marketing approval software, but you still need your marketing team to use it. We all know how easy it is to fall back into old habits so you’re going to need someone who encourages and guides people to use it. Archibald / William implemented its preferred approval workflow software in just six weeks across the whole agency. The agency made sure that everyone who was to utilise the software received training as well as it had a vocal champion – someone who got behind the software. When the champion saw that some individuals were still struggling with the software after the initial training, she sat with them individually to guide them through the system. “You need at least one person to be a champion. - Admatioin is an end-to-end solution designed to make your life easier so you can communicate more effectively.” Jo Giles, Achibald / William.